Art: we all have an opinion. Us cats especially – being the elegant and aesthetic types. We all know what we like. Here’s me in front of a couple of my current likes. (Paddy Hamilton - painting on my right - mentions fish a lot). But it’s about more than likes really. Like a feline, an artwork can touch your soul. It can make you smile, can make you think, can challenge you with some difficult questions. 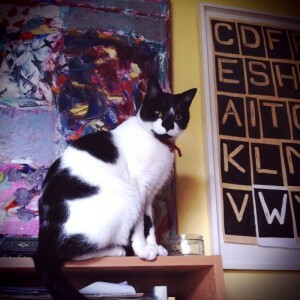 Most importantly, like felines, living with art makes human life better. Banish drab and ordinary. Choose original and inspiring. Take a look at my Art Emporium – opening soon! This entry was posted in Art, feline inspired artworks and tagged cat art, cat inspired artwork, cat paintings, feline inspired artworks, paintings of cats on March 7, 2014 by MrMonty2014.